I hope this letter meets you and your family well and that you are all enjoying the continued blessings of Lord Krishna. Fifty years ago this summer, Srila Prabhupada and a small group of young followers signed into existence the International Society for Krishna Consciousness. The young people who put their signatures to the founding document were all a bit puzzled, especially by the word ‘International.’ Their new society extended to a mere thirty people who regularly gathered in a small shop front in a not so salubrious back street of New York. The vision for what the Society would become all belonged to Srila Prabhupada, who saw it expanding across the world and into every town and village. He knew it would take the determination of every member, but he knew that with Krishna’s help, it would ultimately be a success. And we are all enjoying that success today. 2016 sees us with more than a dozen centres around this country and nearly 55 small groups. The number of members is in the thousands now, with many projects and programmes for attracting the public to the spiritual messages, celebrations, music, art and cuisine of Krishna consciousness. You are one of our valued members who is taking forward Srila Prabhupada’s movement and by your efforts you are inspiring existing members and attracting our future members. 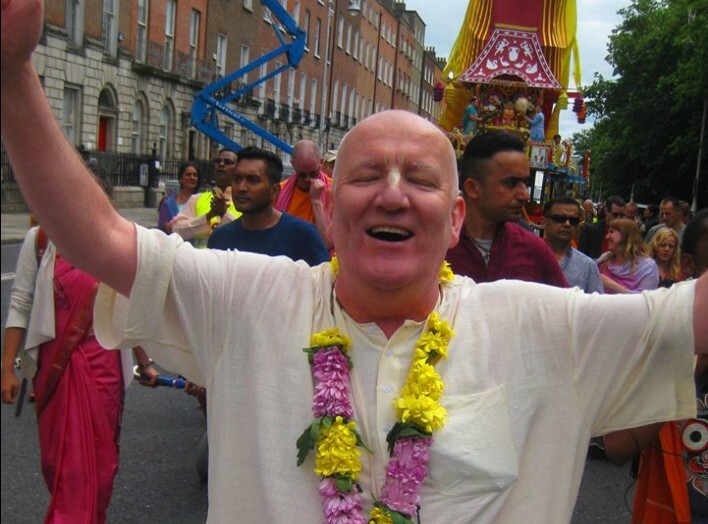 Whether you look after a group, sing kirtan, distribute books or manage a centre – or whether you are offering spiritual support to friends – your participation in ISKCON is making a real difference. So in this 50th anniversary I’d like to invite you to the second ISKCON National Convention. Last year over two hundred devotees came to the one-day event in the new temple in Leicester. We all got to meet each other, learn from the informative workshops, sing kirtan together, and share ideas. Devotees came from Scotland, Ireland, Leeds and Lowestoft as well as all other UK centres. Feedback was very positive with all participates saying that it was an event they’d like to come to again. The new Leicester temple is quite spectacular, a former Victorian bank with impressive architecture, a vast interior which has recently been refurbished on two floors. This year, I would like to meet you there and hear from you your suggestions how to improve our members’ experience of ISKCON. How can we serve our members better, and what do we need to provide them? The more representatives from around the country who attend, the more ISKCON in the UK can be moulded to accommodate the growing needs of our ever-expanding movement. 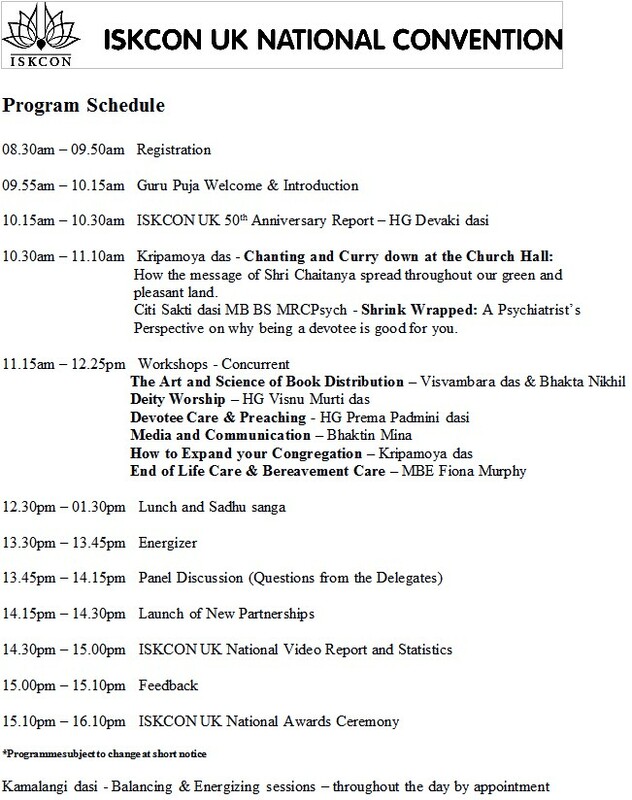 The National Convention will be a one-day event, from 9.30am to 5pm, it will involve some travel and possibly even an overnight stay; but if you come I can promise you wonderful association, informative workshops and a unique opportunity to share best practice and further development ISKCON UK. So please make every effort to attend. If your group, project or centre has been particularly innovative or active this year, I’d really like to share your contribution with all the members through a three-minute video which will be played during the conference. Please email iskconukconvention@gmail.com and we will send you brief guidelines for creating the video, submission deadline is 15th September. I intend to publish the schedule shortly. I would like to thank you for your service, giving your time and look forward to seeing you at this special event.